The Langham Hotel of 1863–5 was London’s largest hotel when new, and among London’s largest buildings, a prime example of what were dubbed ‘monster’ hotels, more kindly ‘grand’. Following the railway-station hotel boom of the 1850s the Langham was a significant novelty for being dissociated from a terminus. The Langham Place site in a smart district was thought right for a hotel for its openness, therefore healthfulness. Distance from a railway station could be marketed as a virtue, but this was still a bold speculation that looked to American rather than local precedents. The Langham Hotel (by The Langham, London, reproduced without changes under a Creative Commons licence via Wikimedia Commons [CC BY-SA 3.0 (http://creativecommons.org/licenses/by-sa/3.0)]). If you are having trouble viewing images, please click here. 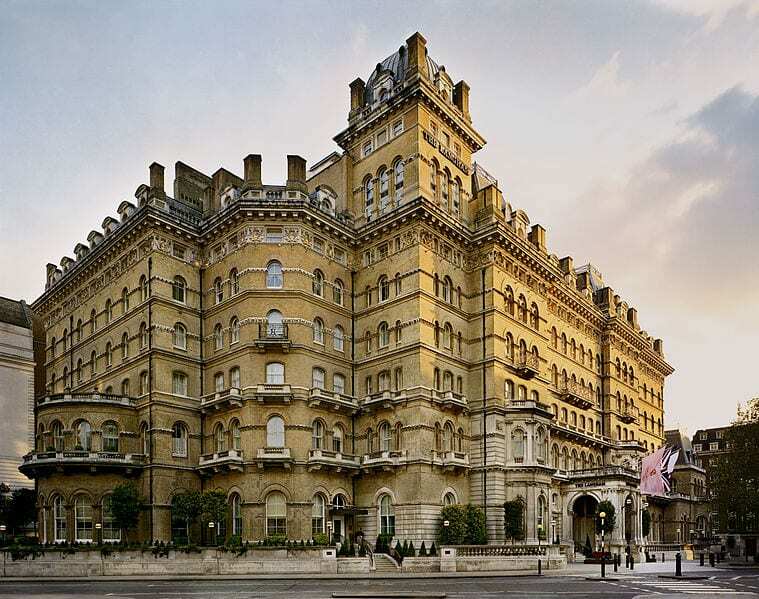 The Langham Hotel Company Limited set out to build a hotel ‘on a scale of comfort and magnificence not hitherto attained in London’. Its ‘very respectable’ directors were a solid bunch of mercantile men, headed by two aristocrats stooping to trade – Henry Chetwynd-Talbot, 18th Earl of Shrewsbury and Talbot, as president, William Coutts Keppel, Lord Bury, as vice president. Among the directors was Peter Graham of Jackson & Graham, a high-class Oxford Street furnishing firm. The adjacency of several embassies including the American consulate inspired hope of accommodating diplomats. Imminent completion of the Metropolitan Railway with its station at the top of Great Portland Street would, it was claimed, make up for the absence of a main-line terminus. A design competition was won by John Giles, a novice architect. He was persuaded to work with the more experienced James Murray, whose designs for the interiors were regarded by the competition committee as especially good – the forced partnership ended up in court over ownership of the drawings. 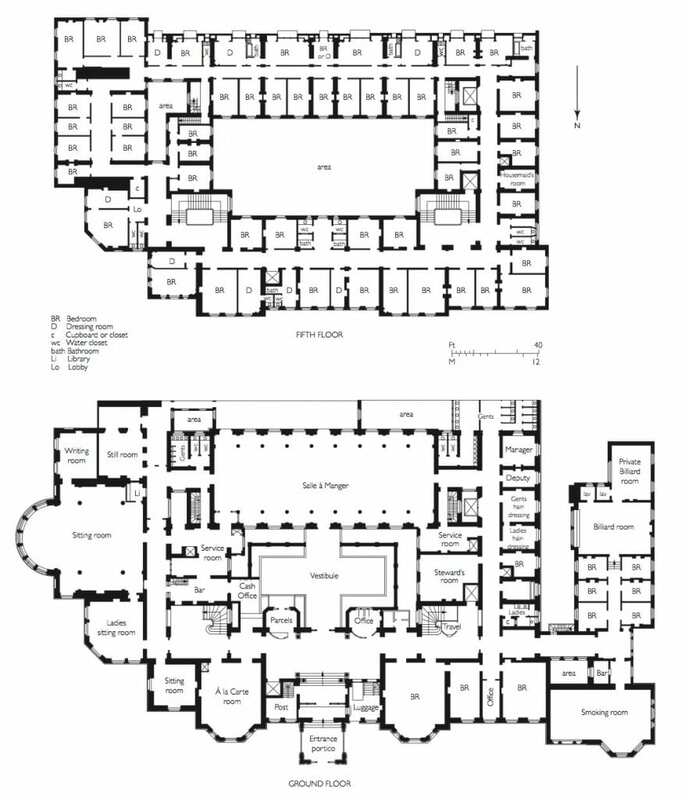 Giles was probably responsible for the floor plan and exterior, Murray for details of the internal layout. Lucas Brothers, who had recently finished the London Bridge Railway Terminus Hotel, were contractors and major shareholders. Jackson & Graham supplied furniture and brought in Owen Jones to design interiors. 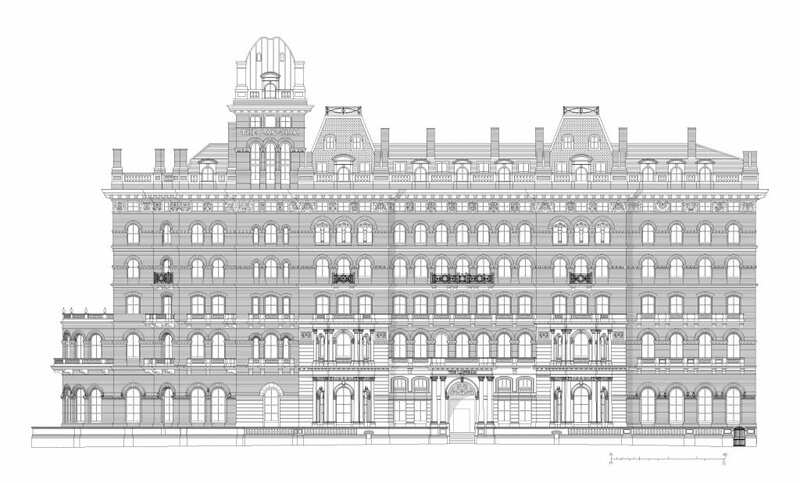 The Langham Hotel, drawn from measured survey. Please click to download a pdf version of the drawing (© Survey of London, Helen Jones and Andy Crispe). Plans depicting the layouts of the ground and fifth floors of the Langham Hotel in 1907. 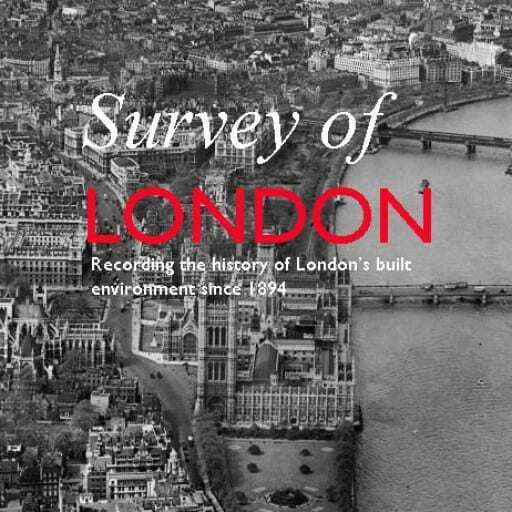 Please click to download a pdf version (© Survey of London, Helen Jones). The rich sculpture which adorns the eaves cornice and imposts of the lower-storey window arches (© Survey of London, Derek Kendall, 1988). The sculptural detail repays close examination. Below the heavy eaves cornice there are griffins and sphinxes, some addossed and seated, others rampant yet bovine, made of moulded cement on slate armatures. Livelier and lither stone-carved creatures, more griffins, lions and lizards, grace the imposts of lower-storey window arches. These ‘semi-Gothic Grotesques’ were harshly judged – ‘Their antics … have an artificial and done-to-order look about them, very different from the grim humour of ancient work.’  Hitchcock, who suspected the influence of Viollet-le-Duc, saw ‘elephantine playfulness’, which seems fairer. In December 1940, bombing destroyed the building’s north-east corner and, with consequent flooding, the hotel closed. The BBC took up occupation from 1941, using the premises as offices and studios to 1986. Reconversion to hotel use in 1987–91 was by Hilton International.